You on the cutting edge of technology, have already made yesterday’s impossibilities the commonplace realities of today. I think we all agree, technology rules today’s world —whether we like it or not. No matter which journey our children may decide to embark on, chances are computers will be an integral part of it. Becoming digital savvy is thus, a smart step to get them prepared for these commonplace realities of today. We received full access to Digital Savvy, a $120, one-year self-study introduction to computer science course from CompuScholar, Inc. An option for a $15 per month subscription is available also. And lastly, CompuScholar, Inc. offers enhanced instruction with a teacher-led annual program, $300, and monthly for $35. 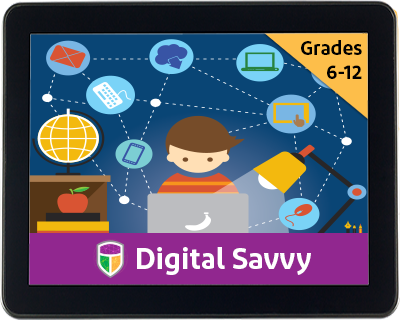 Digital Savvy delivers a comprehensive introduction to computer skills for children in grades 6 to 12. It presents a clear, logical sequence of topics, with easy access to all materials from anywhere within the course. Being web-based, it delivers lessons via video-streaming, with an option for media download. As with most web-based programs, PDF documents for lectures, activities, and answer keys, are included as well. Each chapter in turn offers 3 to 6 lessons, each with a quiz, an activity, and a test. A lesson offers the same content in two formats: video and text. It seems we always prefer video over text, but it’s excellent to have both alternatives. A video may take 10 to 20 minutes. Then comes the quiz. It’s short and easy, and Super Hero could take it up to 3 times to get a 100%, if he wants to. He usually does so in 1 or 2 attempts. The activity offers a hands-on project, excellent to bring everything together and wrap it all up. At one lesson per day, Super Hero could easily complete one chapter per week. He does take a more leisurely approach, and studies about 3 lessons weekly. Still, he’s learned a great deal so far, and that’s only with the first four chapters. He will definitely continue on and complete the course. He definitely wants to finish it. Teachers or parents are provided with an independent account to manage the course. It offers teacher guides, answer keys, the ability to enter grades for activities submitted, etc. One can also edit quiz grades if needed, and enter additional siblings/students. Clicking on a particular quiz reveals the actual student’s responses. It’s possible to click on each question to view more details. I believe high schoolers in particular, will appreciate these grading functionalities. Digital Savvy’s video production seems quite professional, except for the audio. It is clear but not loud enough. We always have to crank up the volume way up lest we freeze still to avoid any competing sounds. The video itself is engaging with lots of relevant images and a pleasant female voiceover. There’s a mix of images varying from photographs to illustrations to cartoonish clipart. I like the photographs and illustrations, but not the cartoons. They grant an inelegant image in my opinion. But then again, I am not in the intended audience. Super Hero is, and he finds the clipart just fine. I do like to have a video player offering options to go forwards or backwards 5, or 10 seconds. Digital Savvy’s player doesn’t offer that. Nor is it possible to pause the video with the spacebar —I’ve grown so used to doing that. I do like to pause from time to time to comment or throw in something relevant. Super Hero somehow managed to get the spacebar working on the laptop. Yet, we still haven’t been able to make it work on the desktop. Obviously, these are petty pet peeves that do not alter the quality or delivery of this excellent course. I just thought I should mention them for the sake of completeness. Being a homeschool with two computer scientist adults, I’d like to think we’re savvy enough in this field. Both, Roberto and I, try to impart the knowledge of technology to Super Hero constantly, and often casually. Now we’re tying several concepts together, thanks to Digital Savvy’s solid, structured introduction to computers. I’m enjoying the course as much as Super Hero. I don’t sit with him to study it together, but I will sometimes ask him to bring it to our kitchen’s nook to watch while we lunch or dine. I can’t wait for Super Hero to continue learning with Digital Savvy’s coming lessons. Afterward, I will definitely check into CompuScholar’s computer programming courses. If they’re anything like Digital Savvy, they’re winners! Interested in other Computer Courses?